As a home or building owner, it is your job to keep your HVAC system working efficiently and to make all necessary repairs as issues arise. Keeping your HVAC system in working order requires a financial investment on your part, but this is the cost of keeping your home comfortable, allergen-free, and efficient. Below are the average costs for a variety of residential HVAC services. Always shop around to find an affordable HVAC professional to service your system. Read online reviews on third party sites while you are shopping, because a very low price could mean lower quality service. For a 1,000 square foot home, installing an entirely new HVAC system costs about $12,000. Individual HVAC system components, like central air conditioning and central heating, can cost a few thousand dollars apiece to install. The exact cost of your installation depends on a few factors, such as the size and layout of your home and whether it is new construction or if the walls will have to be opened for the installation. The cost to upgrade an outdated HVAC system can vary widely just like the cost to install an HVAC system. This is because upgrading a system can mean many different things, like upgrading a heating pump or installing an air purifier. 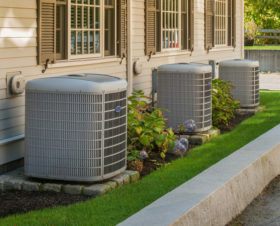 The size of your home, the condition of your current HVAC system, the brand of the equipment you want to have installed, and the type of equipment you plan to install all play important factors in determining the final price you will pay for an HVAC upgrade. Upgrade projects can cost anywhere from a few hundred dollars to more than $10,000. Often, HVAC systems have yearly maintenance contracts. On average, these cost $150 per year, which covers all of the routine services performed on the system during that year. One-off service visits can cost $70 to $100 apiece. Because an HVAC system has so many components, there is no “one size fits all” price for repairs. A refrigerant leak can cost between $200 and $1,500 to repair. Other repairs are less expensive, like replacing a broken thermostat. If you do not have experience repairing HVAC system components, do not try to DIY your repair. You can potentially make the problem worse, causing a more expensive repair bill for yourself, or potentially injure yourself. Always call a certified HVAC professional to handle repairs. An efficient HVAC system is an investment. It will keep your home cool in the summer, warm in the winter, and well-ventilated year round. You cannot expect quality HVAC service to be free, but you should expect to get a good value for the money you spend. To talk more with one of the HVAC professionals on our team at Naughton Mechanical LLC, give us a call to schedule your initial consultation with us.